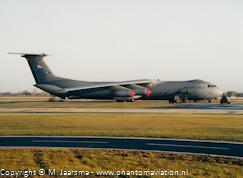 The C-141B/C Starlifters were replaced by the C-17A Globemaster III. In 2006 the last Starlifters were withdrawn from use. 285 aircraft were build, 284 C-141As and 1 static test airframe. 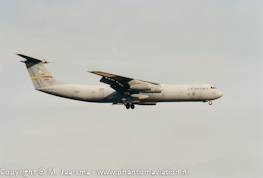 C-141A: Original version of the Starlifter. C-141B: Upgraded C-141A with fuselage lengthened by 23.3 feet and adding aerial refuelling capability. 12 of these aircraft were modified to support special operations low-level (SOLL). 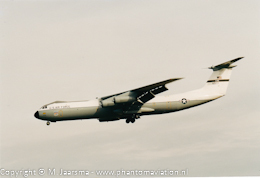 C-141C: Upgraded C-141B which added additional avionices to the aircraft. Aircraft withdrawn from use with a new role as ground instructional aircraft redesignated GC-141. One aircraft is of note. C-141B (later converted to C-141C) received nickname Hanoi Taxi after it airlifted American prisoners of war to freedom from Gia Kam Airport in Hanoi, Vietnam (February 12th. 1973). It flew two missions transporting 78 POWs and 2 civilians to the Philippines and from there 4 missions to the USA. Hanoi Taxi assigned to the 445th AW on approach to RAF Mildenhall in March 2001. The Hanoi Taxi is now preserved at the USAF museum at Wright-Patterson AFB, Ohio. All photos below have been digitalized. The 305th AMW based at McGuirre AFB, New Jersey operated the C-141B. RAF Mildenhall March 2001. 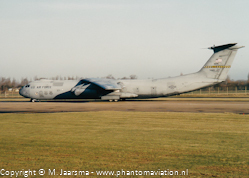 Seen landing at RAF Mildenhall in March 2001 a C-141C assigned to the 452nd AW based at March AFB, California. C-141Cs were also flown by the 459th AW based at Andrews AFB, District of Colombia. RAF Mildenhall March 2001.